Disclosure: This post is sponsored by Moms Select. I am receiving complimentary items in exchange for participating on the blogger team. This past spring I applied to be part of the Chick-Fil-A Moms Panel and was accepted for the 2017-2018 year. I am so excited because I love the food at Chick-Fil-A. I also love how they have offerings for their gluten free customers as well. This past June many locations began offering a gluten free bun which I wrote about, you can read about it here. 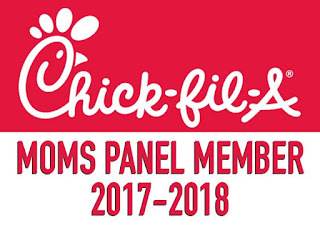 What is the Chick-Fil-A Moms Panel? The Chick-fil-A Moms Panel is a corporate initiative. 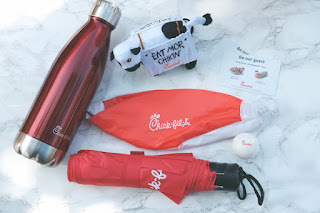 The intention of this Mom Panel to bring firsthand Chick-fil-A news and announcements, gather feedback on future programs (such as Kid's Meal prizes) provide exclusive opportunities, and to show appreciation by providing fun gifts along the way. The best way I can explain it is, it’s kinda like a Market research panel. Some of the information I will be able to share, while other times I will not be allowed to share (per the non disclosure agreement I signed). I received a fun welcome gift this week. In the box was an umbrella with Chick-Fil-A logo, a lip balm, small stuffed cow, small beach ball, metal water bottle and two “be our guest” cards (one free breakfast item & one milkshake). I am looking forward to this new adventure with the Chick-Fil-A Moms Panel.